You know that terrible feeling that looms over you like a black cloud when you have a large task ahead of you that you can’t possibly hope to combat on your own? Even if there’s nothing that springs immediately to mind, there’s a good chance that you can identify with the feeling behind that idea. In today’s post, we’d like to discuss the thing that we think is looming over a whole lot of people out there. We’re speaking, of course, about living in a house that’s plagued by clutter. The Point Pleasant junk removal experts at Barten Bros have seen it time and time again, but the good news is that allowing us to haul away junk that’s taking up space in your home actually comes with a number of great benefits. 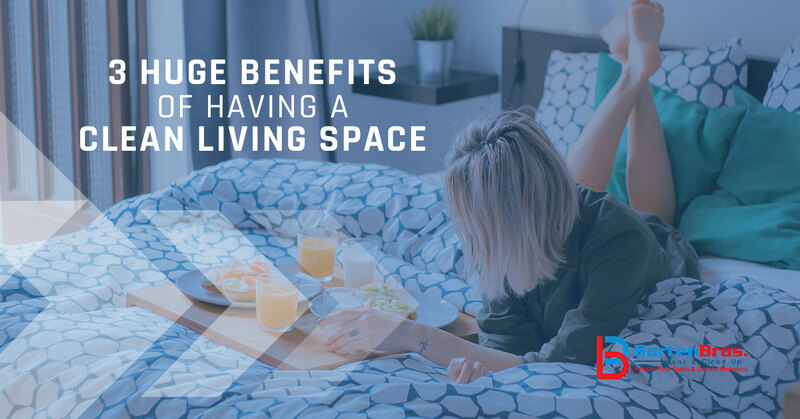 That’s why in today’s post we’ll be highlighting a few of the biggest benefits of having a clean living space. Keep reading to learn more! Why Keep Your Living Space Clean? Our homes are the places that we turn to for rest and relaxation, and there’s nothing worse than coming home to a room that’s cluttered with your belongings. In many instances we find that people have a habit of holding onto things they don’t want or need anymore. Don’t worry, because it happens to everyone! Fortunately clearing up some space and getting rid of some of those things can reduce the amount of stress you feel. A cleaner living space also means that when it comes time to relax, you’ll be able to do it more easily. Rather than feeling stressed out about another thing that needs to get done, you can simply kick back on the couch and watch a movie knowing that there’s not some chore that needs to be done taking up space in the back of your mind. Whether you’ve always wanted to host guests in your home, but were afraid to do it or you have always dreamed of using the room that had junk in it for another purpose, finally getting rid of the clutter that’s taking up space is just going to make you feel better. There’s nothing like being able to actually use the space you have in your home in the way that you want to use it, so take advantage of the team of junk removal experts at Barten Bros and start taking back your living space! At the end of the day, the biggest reason to get rid of junk in your home is because you know it’s going to make you feel better. It doesn’t really matter why you feel better, but you know that you will. That’s why you can put your trust in the Point Pleasant junk removal team who knows how to get the job done the right way the first time around. We have experience offering a number of different junk hauling services and we’d love to lend a helping hand. Contact us today to get the process started!